Your children make you beam – from their sense of humor to their mannerisms that seem to mirror your own, you’re amazed by how much they take after you. And when they smile back at you, you notice another thing they’ve been given from their parents – crooked teeth. Your kids are young though – is it too early for children’s orthodontics? 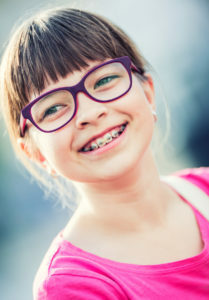 The team at Cosmetic & Family Dentistry explain when the best age for braces and orthodontic treatment is for kids and that starting young can give them a winning smile that will last a lifetime. When Should Kids See An Orthodontist? The American Association of Orthodontists recommends that all children see a specialist at age 7 to check in on the development and alignment of incoming adult teeth. When kids reach their seventh year, orthodontists like Dr. Deborah A. Romack can examine the position of permanent adult teeth that have erupted in the mouth. If she spots a problem, she can use oral appliances or create a treatment plan for your son or daughter’s children’s braces in Weatherford. Generally, around age 10 to 14, kids can begin successful orthodontic treatment. At this age, the vast majority of permanent, adult teeth will have come in, and the jawbone is still developing, making it easier to shift the dentitions and correct their placement. Talk with Dr. Romack if your child is around this age and is exhibiting tooth alignment issues – with a comprehensive exam, she can advise on the best way to make your child’s smile healthier and perfectly straight. And, although all these physical issues may require braces, we also need to remember the emotional and mental health effects that having noticeable smile imperfections can cause – braces and straight teeth can improve self-confidence. How Long Will My Kids Have To Wear Braces? Depending on your dental needs, you can generally expect on a course of treatment for braces to last between 18-30 months. After your braces are removed, you’ll wear a retainer to maintain the correct position of the teeth that have been aligned properly. Usually, kids will wear retainers for a couple months to a couple years, and some patients may require permanent retainers to keep their smile straight. Now that you know when kids should see Dr. Romack, when they should receive braces, and why they need them, schedule your appointment with Cosmetic & Family Dentistry to get your child started on the path to a beautiful, healthy smile! by: Dr. Deborah Romack at May 21, 2017 .